According to a recent IgnitiionOne's Q2 Digital Marketing Report, advertisers are turning to Facebook in droves while reducing their display ad spend on Google. Total spend on programmatic, according to IgnitionOne, is experiencing a phenomenal rate of growth (33 percent year-over-year growth). Facebook's share of display ad spend (limited to the IgnitionOne platform) rose to 16 percent while Google's display share fell to 31 percent. Facebook still has quite a long way to go but it seems it is certainly closing the gap and quickly. 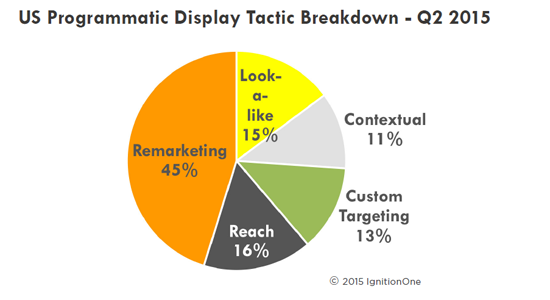 IgnitionOne also revealed some interesting data on the programmatic display breakdown. According to activity on its platform, retargeting was the dominant display tactic used among its advertisers, with 45 percent of display ads shown to past site visitors in Q2.